Modi'in Illit resident grumbled about delay and missed overturned bus. After miracle became clear she returned with basket of chocolates. An haredi woman, a resident of Modi'in Illit, complained about the load at the women's health clinic this morning. The delay made her miss the bus that overturned on Route 443. After the miracle became clear, she returned with a basket of chocolates and handed it to the nurse at the Kupat Holim. "It turned out that she missed the bus that turned over," said Maccabi Health Services Marketing Director Moshe Schlesinger. "She heard about the fatal accident and was so moved she decided to buy a gift for the secretary who delayed her." 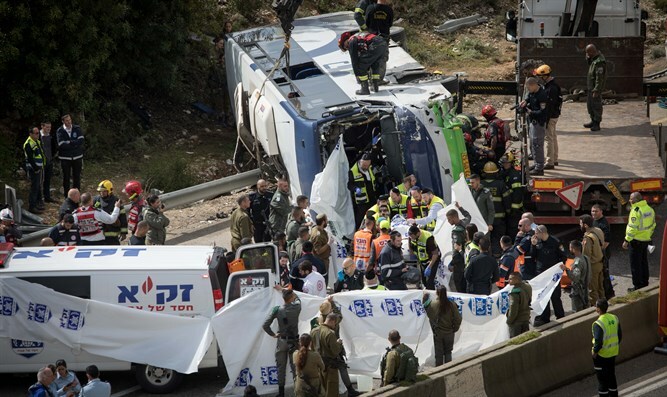 The fatal accident occurred on Route 443 from Modi'in to Jerusalem. A public bus making its way to Jerusalem collided with a commercial vehicle. The bus driver lost control and turned over. The result was two dead and more than 40 injured, some in very serious condition, all evacuated to hospitals. Nineteen of the injured were evacuated by MDA to Shaare Zedek Medical Center in Jerusalem, two of them in serious condition, three moderate, and 14 light, including two parents and their 4 daughters the youngest of whom is 11 months old. As of now three of the wounded were released.